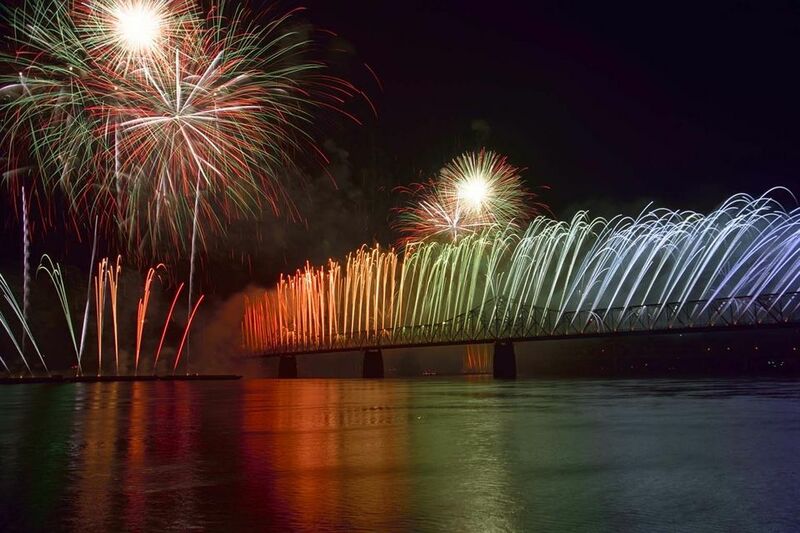 Each year, close to half a million people gather around Louisville's riverfront to watch Thunder Over Louisville, the largest fireworks show in the world and the opening event for the Kentucky Derby Festival. The 28-minute fireworks show is preceded by the Thunder Air Show, one of the top five air shows in the country. The Thunder Air Show features more than 100 planes performing hours of diving and acrobatic stunts. Both the air show and the fireworks show combine to make Thunder Over Louisville one of the most anticipated annual Kentucky Derby Festival events. Kroger, Thunder Over Louisville's first sponsor, developed the idea for a Kentucky Derby Festival opening ceremony back in 1988 along with Dan Mangeot and Wayne Hettinger. The first Thunder Over Louisville occurred in 1990, though it had not yet earned its current name. In 1991, the second annual Thunder Over Louisville gave the event its official name as well as its format. The Thunder Over Louisville Air Show began as a way to amuse visitors during the time leading up to the fireworks. However, as one of the top five air shows in the country, the Thunder Over Louisville Air Show now has its own bragging rights. The Thunder Over Louisville Air Show features more than 100 planes performing more than six hours of fly-bys, acrobatics, and diving stunts. It also gives visitors a chance to view the newest planes being flown by the U.S. Army, Navy, Air Force, and Marines. At 9:30 p.m. on the night of Thunder Over Louisville, the real show begins. You'll know that the fireworks are getting ready to start when two helicopters fly a large American flag as the "America the Beautiful" and "The Star Spangled Banner" are blasted over the speakers. Then, the Thunder Over Louisville fireworks show begins. If you've only ever watched Thunder Over Louisville on TV, you've never truly experienced it. Getting there, parking, finding a place to watch the show, and getting home in the traffic can be a hassle, but it's completely worth it when those fireworks start and you feel the pounding of their explosions all over your body. You may be surrounded by strangers that are standing closer to you than you care for, you may be covered in ash and soot when the show concludes, and you may sit in your car for three hours in a parking garage trying to get home, but you'll smile through all of it and swear to go back next year. While it seems like an event this extravagant would require visitors to pay some sort of admission, Thunder Over Louisville is a free event. With the exception of a few restricted areas, anyone who wishes to watch the show can do so from the Louisville or Jeffersonville waterfronts for no charge whatsoever. Visitors can also watch the show from the Waterfront Park Chow Wagon as long as they're wearing a Derby Festival Pegasus Pin from the current year. The Thunder Over Louisville Air Show begins at 3 p.m. and goes on until around 9 p.m. that night. At 9 p.m., the "Star Spangled Banner" and "America the Beautiful" will play, signifying that the fireworks will be starting soon. The fireworks go off from 9:30 to 10 p.m. Parking for Thunder Over Louisville is available all over Downtown Louisville. There is no charge to park at a parking meter, but most parking garages and lots will charge a fee. The earlier you get there, the better your chances are to find a parking space as close to the river as possible. The Transit Authority of the River City also makes trips to and from the riverfront throughout the event--for schedules and pickup/drop locations, visit the TARC website. Thunder Over Louisville visitors can bring drinks that are contained in plastic bottles, but cans and glass bottles are not permitted. No alcoholic beverages can be brought into the Thunder Over Louisville area, though beer is available at the Waterfront Park Chow Wagon and the Belvedere Beer Garden. Weapons, tents, bikes, skateboards, skates, and pets are also prohibited.